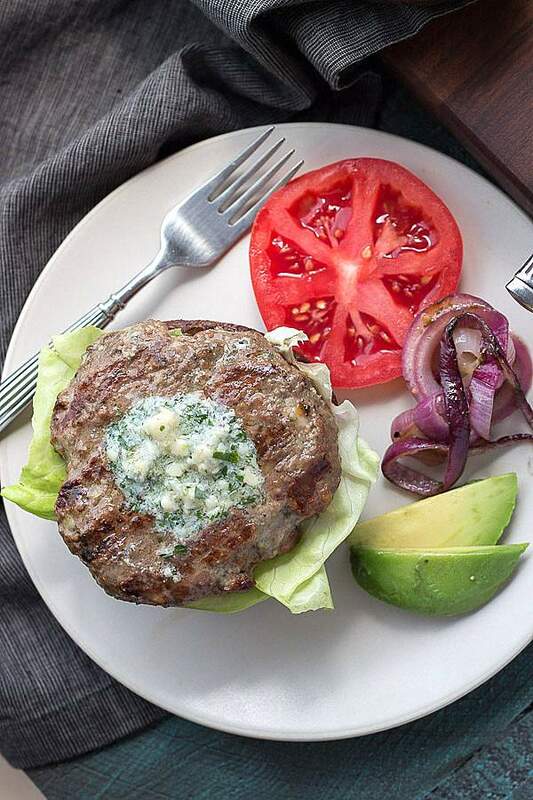 A low carb blue cheese burger so crazy amazing with flavor, you won’t miss the bun! This Summer I thought I’d try something fun — a series of low carb burgers. If you’re going to have a bunless burger, or even a lettuce wrapped burger, it ought to be super tasty, right? I admit to missing the flavor component of a high quality toasted bun on my burger, but when a juicy burger tastes it’s ultimate best, you just don’t need one! Let me recap the great burgers I’ve brought you thus far starting with Tasteaholic’s Cheesy Portobello Burger. This juicy burger has just 5 ingredients and 5 short instructions. 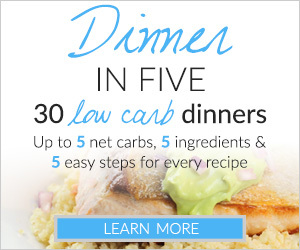 Don’t forget to check out their fantastic cookbook Dinners in Five! Then, I posted a tasty Low Carb Lamb Burger with feta cheese and a tomato-cucumber salad. And most recently, I shared how to get that great Steakhouse Burger flavor everyday with two common ingredients. So, I’m just going to say it… These are hand down one of the best burgers I have ever had. I’m not just bragging or blowing smoke. These are our favorite burgers and we make them quite a bit. I mentioned that awesome steakhouse burger recipe I brought to you a few weeks ago. I’m proud to say that I’ve received a ton of nice comments about it on Twitter, Facebook and email. People are calling it the “best burger they’ve ever made”. It only calls for two ingredients (besides the beef) and it’s awesome! This low carb blue cheese burger came about because my husband loves blue cheese. He decided to mix some crumbled blue cheese into our awesome steakhouse burger recipe one day, and the heavens parted and sunbeams shined down. The blue cheese burgers are AWESOME and he gets all the credit! I do want to warn you though, these are flavor bombs on steroids. I am proud to share them with you today, but you need to know that your friends are probably going to ask for the recipe. 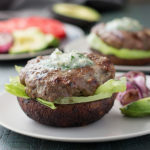 We served these low carb beauties on marinated, grilled Portobello mushrooms to add another flavor dimension and to elevate the burgers for photos. The Portobello also serves as a low carb side as well as a base or keto bun for the burger. We all know that steak, mushrooms, and blue cheese are a classic trio, so why not apply it here? 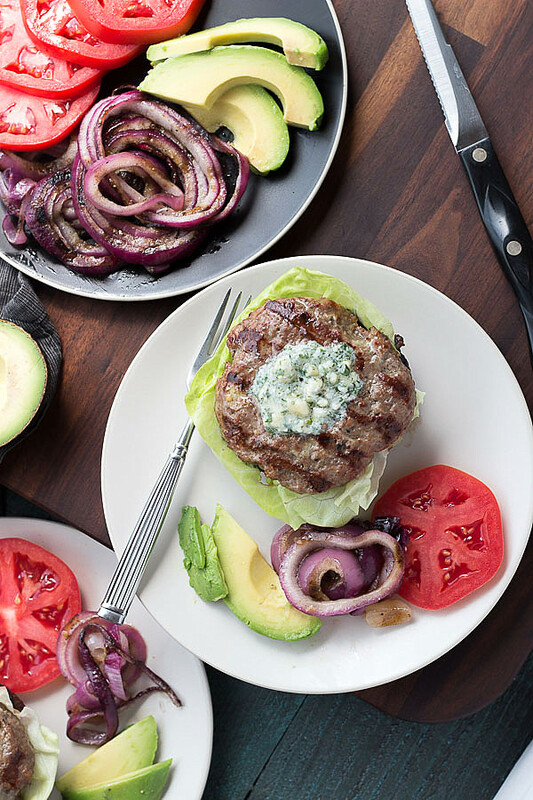 To make this recipe even fancier, grilled purple onions and a compound blue cheese butter takes it over the top in ultimate LCHF, keto burger decadence! 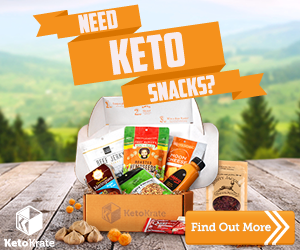 [MUSINGS] I just want to talk about better quality meat for a minute. 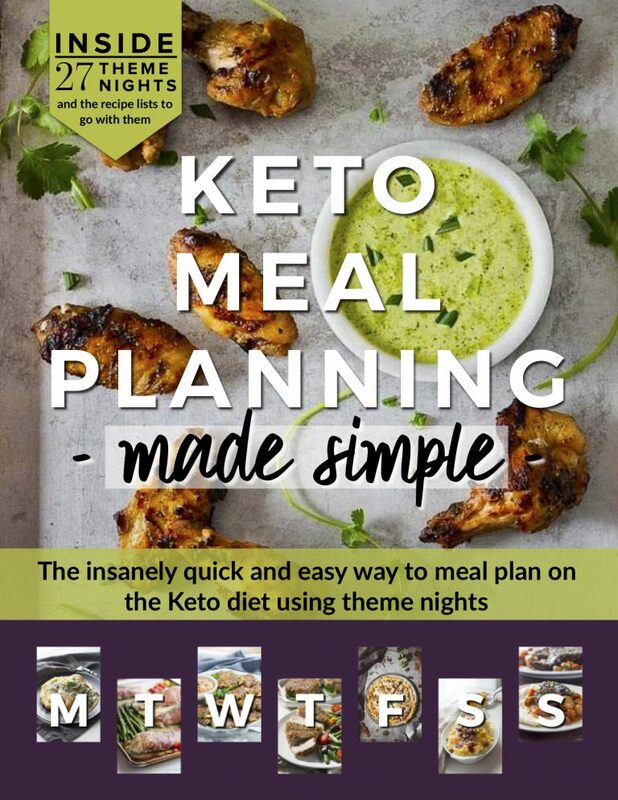 I used to buy the cheapest meat I could at the grocery store but often ended up with tough and gristly dinners or dishes that were less than flavorful. 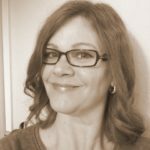 It’s taken me years to realize that if I want that “wow” factor, I need to use better ingredients — whether it’s great butter in a cake, a 1 1/2 inch rib eye for the grill, or American Kobe Beef/ Grass-fed beef for my burgers. I’m on a budget like everyone else, but am fortunate to be able to splurge on better quality meats when I want to share a great meal with family and friends. My trade-off is slightly smaller portions per person, but better nutrition and superior flavor. When the entrée tastes amazing, the sides are great, and the conversation is good… no one misses an ounce or two of meat. Do you agree? 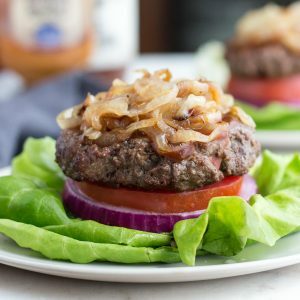 Each low carb Blue Cheese Burger with mushroom, onions, and compound butter is net 8 carbs per serving! NUTRITIONAL VALUES PER PATTY: Calories: 476, Fat: 37, Total Carbohyrates: 3, Fiber: trace, Protein: 31. A low carb blue cheese burger so crazy amazing with flavor, you won't miss the bun! A well seasoned burger patty sits atop a marinated, grilled portobello mushroom and is topped with compound blue cheese butter and finished with marinated grilled onions. Compound Butter: Mince the parsley and shallot. Put the butter in a small bowl. Stir or mash with a fork until smooth. Stir in the crumbled blue cheese, shallot, and parsley until combined. Scoop the compound butter onto a piece of waxed paper, centering it lengthwise down the middle of the paper. Roll into a log, twist the ends, and refrigerate. Mushrooms and Onions: Cut the onions into 1/4 - 1/3 inch rings. With a medium sized spoon, scrape out the gills from the mushrooms. Pour the salad dressing into a bowl and dip the mushrooms into the dressing, distributing the dressing on all surfaces. Coat the onions with the rest of the dressing. Grill the Portobellos on the grill, gill side down first, then flip to finish cooking. Cook the onions to char them a bit. Place the mushrooms and onions on a platter and tent with foil to keep warm. 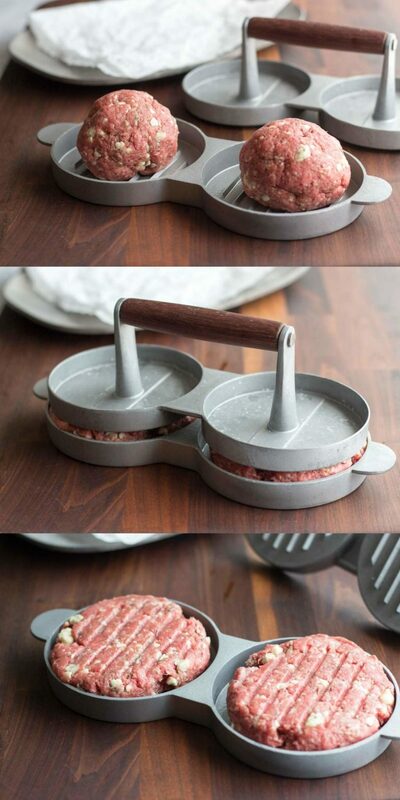 Blue Cheese Burgers: Break up the ground beef. If it breaks up into super tiny pieces, add 2 tablespoons of oil. Also add the oil if you are using grass-fed beef because that tends to be a little lean, otherwise you're good to go. Sprinkle the Worcestershire sauce and Montreal Steak Seasoning over the meat and mix thoroughly with your hands. Add the blue cheese and mix again. Divide the meat evenly and roll into three balls. Flatten into patties (I use a burger press) and make a slight depression in the center of each patty. Grill to your desired level of doneness. Assemble: Separate the onions. Place the hamburger patties on the mushrooms, top with a pat of blue cheese butter and then finish with 1/3 of the grilled onions. This was a fantastic burger. I just did it bunless. These sure sound good . Question: In one part of the recipe it says 708 calories/59 fat grams, but in another part it says 476 cal./37gr. Not sure what accounts for the difference? Was this ever discussed why there are two differ stats? 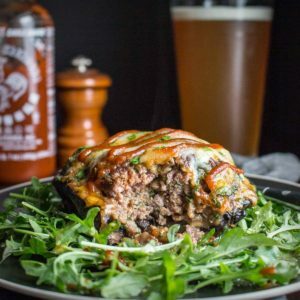 I love blue cheese and burgers, so got to try this recipe!